KidsEBookBestsellers.com: HONOR CROWNED, Crowned a Top Ten Bestseller by Kindle Kids. HONOR CROWNED, Crowned a Top Ten Bestseller by Kindle Kids. Honor Crowned by Michael G. Southwick climbed all the way to the #6 spot in the Children's section of the Amazon Kindle store on June 27th. Michael joins us today to share the story of his trilogy and its success in electronic format. He answered every question I threw at him, so enjoy the wealth of wisdom and experience he has to share. Let's start with hearing what your book is about. 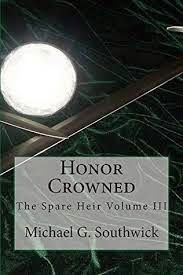 Honor Crowned is the third book in The Spare Heir series, proceeded by Honor Bound and Honor Found. Jorem is the fifth son of the king. Although he is an heir to the throne he is an unwanted one. As a rather clumsy and awkward boy Jorem is entirely unlike his strong, handsome brothers. The King and kingdom still mourn the loss of the queen who died at Jorem’s birth, some even blame Jorem for the loss. Adrift and alone in a sea full of people Jorem is befriended by an aging wizard. The young prince learns not only of magic but much of the world both past and present. With no magical abilities of his own he’ll never be a mage but the wisdom of the wizard may prove more useful than he knows. Even in the training arena of the weapons master the words of the old man ring true. As Jorem’s story unfolds the quiet words of counsel of the wizard guide the prince on his path. Determined to be more than a spare Jorem sets himself on a path to be more than he is. When dangers to the peace of the kingdom arise, it is the least wanted who steps up to the challenge. He may not be strong nor agile and quick, but he’ll do what is needed to keep the land whole. By shedding his role of prince Jorem earns his place on his own. By holding to his own code of honor he gains not just respect, but many friends on his way. Dangers, deceit, monsters and magery all pile against a young man who is more than a prince. He will not turn aside in the defense of the people. When the time is at hand and the need is the greatest, being different may be what is needed the most. In time Jorem learns there is more to honor than a badge or crown and more to himself than anyone ever expected. A few years ago while camping with my son, we were all snuggled up in our snow cave unable to sleep. To pass the time I told him a story from a dream I had dreamt. He liked it so much I wrote it all down. For over a two years I sought out publishing agents. A few had kind words, but none were interested. After hearing of the success of a friend I decided to publish independently. Several years ago the task would have been daunting, but with technology today the process was quick and easy. E-books have instant worldwide distribution without the cost of printing or shipping. The biggest factor is when people read the book, enjoy it, rate it well and post positive remarks about it. With the low cost of e-books it’s worth trying a new book from an author you’ve never heard of. People look for high rated books. If they like what they see they give it a chance. For marketing I’ve relied mostly on word of mouth, school assemblies and public comments. Social media (facebook) has been a huge factor for me. The comments I’ve received have given me the desire to continue. Based on my own experience I would have to agree with both studies. Children who have access to e-books and like to read have the world’s largest library in the palm of their hand. How could they help but read more. As for comprehension I think the tactile involvement of a paper book involves the reader, not just mentally but physically. It’s similar to the difference between driving a computer generated car and driving a real car. A mistake in one means game restart and move on, while in the other a mistake is something you’re not likely to forget. My primary target audience is the non readers, younger teens who don’t enjoy reading. Having been in that category myself I understand the problem. They have to read a book for school so they pick the shortest books they can for the assignment, not always the best choice for a good read. My books are short for this reason and engaging enough (hopefully) to give these young readers a good reading experience. With one good book behind them they are more likely to look at some of the great longer novels out there. Since publishing I’ve found my audience is much broader than I expected, spanning the ages of eight to eighty eight. When I first started the publishing process I hadn’t even thought about e-books. On the last step of the process on the site I was using it asked if I wanted to publish an electronic version. I was hesitant at first but decided it couldn’t really hurt. I am so glad I did. I think the most unexpected thing was when I started getting comments on my facebook page from countries around the world. Italy, Germany, Australia, Canada, Austria and many others. It was truly mind boggling at first. I do most of my writing in my spare time, especially when I’m commuting on the train or during plane flights. Occasionally I’ll get a day to devote to just writing but not often. My typing skills are abysmal to say the least so I actually hand write all of my books with pen and paper. It takes time but I’ve found I get much more inspiration if I’m not trying to figure out where the letters on the keyboard have disappeared to. Currently, at the request of friends, numerous readers and the character herself, I am working on the story of Jen. She features in the first three books and wants people to hear her side of things. I’ve just started on it, but I’m excited to hear what she has to say. More and more books are available as e-books every day. Authors who were unable to get their works out before are able to share their stories with us. No matter what a person’s interests soon there will be a plethora of books to fill their wants and needs. With the complexities of the print publishing industry plus the difficulty of breaking into that industry I think fewer and fewer authors will bother with the headaches it takes to get a printed book out through a publisher. For the time being there is still a need for printed books. Not everyone has access to e-books due to equipment needs or internet coverage. Eventually though these problems will be overcome by technology. At some point I can see the only ones reading paper copy books are those of us who love the experience of a book in hand. As an independent author there is no way I could have my books distributed so widely without e-books. I knew authors before the advent of e-books who were self published. They had to drive from bookstore to bookstore to ask if the store would stock their book. It was an exhausting task attempted by few. Today, with the click of a button, my books are available to everyone on the planet with access to e-books. Success today is not dependent on who you know, but more importantly on how good your story is and how well you write it. I firmly believe the important thing is to get them to read. If we can get something into their hands that excites or intrigues them it doesn’t matter the form. Reading expands the mind and opens doors to the imagination. From the imagination it is a short step to creation and the building of a better future. Find out more about Michael and his books by following him on Facebook or on Goodreads.